Hello All! It seems I have a few new people following my blog post. My grand total now must be about four. Ha-ha, just kidding. I have not posted in a while because if I am going to say something I hope it is new material, new knowledge or a new perspective that you can not get anywhere else. I hope to continue to provide value for your eyeball time. A couple of days ago a new mommy came in to discuss my philosophy regarding vaccines. She was educating herself and she needed guidance on how to navigate these waters. She just lit up and found our discussion helpful and informative. It occurred to me that I have only shared these precious tidbits for parents who ask one-on-one. Below is a snippet of what I discuss in an interview. Right off the bat, let me reassure you that vaccines do not cause autism. Having said that, there are some systems/bodies/patients/kids who are so sensitive/ill/different that they cannot handle the stress load of and may be allergic to a vaccine, any vaccine, or any injectable drug. Here are a few items we discussed: 1. age them out; 2. vaccine dosages; 3. industry creep (ha…in more ways than one). 2. an older child who needs to be “caught up” would be caught up with the same vaccine dose that the infant gets; think about it…a child twice to three times as big gets the same vaccine. Relatively, the vaccine and its ingredients is a larger dose because of the smaller body. Why not minimize risks and wait a little? 3. Hepatitis B started out designed to protect military recruits and college students (and drug users), populations at high risk for a sexually transmitted disease. When I worked at a medical center that took care of the women’s prison population, you better believe we gave those babies the Hepatitis B vaccine regardless of maternal status. Now any baby born anywhere has to get it. Hmmm…can you see the industry creep? There is a whole lot more to say, but hopefully this gives you an idea of how I think. Two cases I want to share with you so that you can get an idea where it is I am now in the development/training in becoming an Osteopathic Thinker. I am hoping that I am not the only doctor to think this way. I am in my fifteenth year, so any new young DOs hoping to achieve near miraculous instantaneous results, you cannot think like a conventional doctor! If this helps you to get there faster, great. Keep digging on! Several weeks ago I saw a new complicated but rather easy case. I was really excited to help her figure out the puzzle of her. She flew in from out of state to visit family and her family wanted me to consult her. She has been having hip pain which is affecting her gait for the last year. In the last several months her her right shoulder has been acting up. Orthopedic doctors evaluated and recommended pain pills and a conservative watch and wait approach. Two years ago, she had a partial right kidney resection for cancer. She was born with wacky kidneys. The left kidney is small. The right kidney was a “superkidney.” Her kidney doctors explained that the right kidney was compensating for the sluggish little left one. I thought that explains the cancer. All her life, the big one has been trained to overwork; it became so used to that pace of overworking that it tried to grow more kidney. The surgery completely threw her out of balance. It yanked her left hip high (what i call the intubated left hip) and got it stuck. So for the last year she has been walking around on imbalanced hips. Her posture was also affected by the intubation. So she has been bearing her weightload inefficiently forward and on the right for two years. Now, her shoulder is becoming unhappy. You can read about consequences of the intubated neck and left hip in my book, Osteopathy for Children, for a more detailed explanation. I treated her and after an hour, she got up and walked looser, lighter and freer. They were very impressed. I wasn’t. I have been doing this for years. I do tell new patients that by the time they walk out of their first visit, they will know whether they want to come back or not. During the visit, I surmised that the kidneys were disrupted in their development. I suggested that her mother must have fallen when she was pregnant with her and did not know it, about 1 month, 4 weeks gestation. The next day, she called me and her mother confirmed that that was the case. She was thrown off a horse before she even knew she was pregnant. With this information confirmed, her kidneys can be saved. I gave her names of several DOs in her area. I hope her new doctor uses this info as I would. The other patient is new by a few days but fortunately her mother came with her. She has a large 8 cm ovarian cyst that the doctors insist must be removed. Two years ago, she had surgery to the same side to remove a smaller cyst. They told her that it was an easy procedure, that she would be up and about in 1 week (probably because she is young). She said it took her two months to get out of bed. She was also born with a smaller left ovary and that the right ovary was perhaps overcompensating for the left. I asked the mother if she fell when she was pregnant with her. The answer is yes. At 7 months, she slipped down two steps and fell on her belly. Do you recognize the conventional approach pattern here? She had a horrible recovery for a smaller cyst. Don’t you think she’s going to keep making cysts? They will cut each time after the fact and load her up with birth control to try to regulate and prevent their formation. Isn’t that insane? I like our approach better. Get the truama out of the body. How about that? I hope that these two cases, however dissimilar, have demonstrated to you the common link of traumatic causation in one’s formation. All your medical problems, from an osteopathic standpoint are connected and linked to events that have happened to your physical body. Once you are tired of being sliced and diced and picked apart by the conventional medical system and you are ready to hear something else that can explain how you became you, that is the first step on the path to healing. Ok guys, hold on. This one is gonna be a long one. It seems that by far, human beings suffer from this the most and conventional medicine has been unable to address it to the satisfaction of the sufferers. Once again, the reason you suffer the heavy legs syndrome is there is stiffness and tension in the deep muscles of the pelvis. In anatomy 101 in medical school, we call this the “pelvic bowl.” Just think of the walls of this bowl lined with muscles. Because of a recent or past injury in adulthood, this bowl is distorted. The muscular tensions are out of balance. There will be a tighter side that, for most of the time, you will not be aware. It is stiffer and is the apparent “stronger” side. Most patients will complain of the other side. This tends to be the side that is “looser” and “weaker.” The chronic problem side is really the squeaky wheel that is hoping to get the oil. It is freer, so it is doing all the work of supporting your truncal weight load, moving you forward in space against the downward drag of gravity. That is a lot of work! Over time, it becomes overworked; You go to the doctor and the xray is negative or maybe the cartilage looks worn and you are told that it is arthritis from age and “wear and tear.” There is not very much to be done. You are offered a pain pill or a cartilage supplement. Finally, age and more trauma take a toll. It hurts to move and so you are less likely to move. But you have to eat and some of you really want to eat (in an attempt to self treat and stretch) and so you gain weight. More weight distorts the pelvic imbalance. Then it is all downhill from here. Now, picture your guts and intestines plopped in this bowl. For the women, imagine your reproductive organs in the mix. All those imbalanced tensions begin pulling here and there on your insides. It is an unusual patient who does not have bowel problems with those heavy legs. On your slow heavy walk towards death (hey, aren’t we all heading there? ), maybe you start to have problems regulating your salt and water balance. Your hands may, but mostly your feet start to swell. Then it gets really bad. At this point, it doesn’t matter what changes you make to diet and exercise, you are King Sysiphus daily rolling that stone uphill, getting near the top, only to have in roll back down. In a prior comment, someone suggested that in addition to confirming your suffering, I should help provide answers for what you can do for yourself. I responded, “? ?<*&X#$%&, huh?” How can I guide you safely, in a matter of a few paragraphs, to treat all your old past accumulated injuries? It cannot be done. 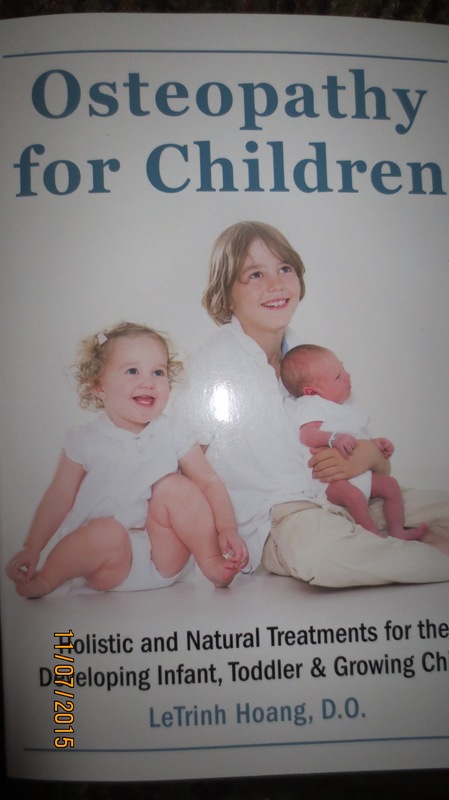 I have found that patients who are open-minded, willing to learn and still seeking are willing to read my book, Osteopathy for Children, available on Amazon.com. This cheap easy to read, digestable book will help you understand my thinking on the mechanical human body. Why should you read a book about treatment for children? ….because it is a primer, Book One, on the philosophy of how we think about treating the human body and undoing all past old injuries. At the end of the book, I give away a few of my newest and safest exercises for you to free yourself up, somewhat. Book Three is actually the book you want. I intend for it to be a big gigantic encyclopedia of how to treat yourself with specific exercises. But I cannot do it on my own. The demand would have to be there to make it worthwhile for the publisher to invest their time on it. In short, you can relieve a little bit of that heaviness by treating the pelvis. It is in the book. You also need to read the section on pillows and neck exercises. If we correct the tensions from above to help you be more “plumb” and in line with your posture, those pelvic exercises will be easier and relief more apparent. Good luck. For instance, when I read Yelp reviews and I see over 50 reviews of someone, and they are all perfect, I want to “call it BS.” Of course they were prompted to do it, so it is all fake. I have read my own reviews and applied my contrarian views to myself. I have been advised several times to respond to the “bad” reviews because the professionals have told me that it really affects people’s decisions. I have read other doctors responses to bad reviews and it seems like it is too much for me. if I have time to address every bad review, then I must be a not so good doctor because I am trying to reel in more patients; even the ones who can’t find the balance between the good and the bad. I really do not have time because I am too booked seeing patients. I could farm out the responses, but then it would not be me and that would really be fake. the worst – people will just have to read between the lines to get a sense of the person writing it; it was a frustrating relationship for me too. the best – Thanks Hillary! seems to me so genuine because it is and because I did not even think to ask. Man, what a compliment, I never thought was MIT material. Several months ago, I went to a Green Festival Expo. One of the booth exhibitors was an “artisanal vegan cheese” company. Hmmm, that sounded good. I was hungry (never sample foods on an empty stomach). I tried a couple sample bites. It was delicious. I went back for more. Then I went back a third time. I tasted every sample they had out there. Initially, I thought, “Wow, this is wonderful. I am dairy sensitive so now I can eat this yummy cheese-like spread without problems.” I looked at the ingredients and I discovered that vegan “cheese” is made with cashews. The next day, my sinuses started feeling full and I found myself clearing my throat. I thought “Uh-oh, I think I am sensitive to cashews.” As I thought about it some more, I realized the “wrongness” of what I had done to myself. What really happened was that I consumed a product that was altered from its natural form to deceive my taste buds into believing I am eating something I shouldn’t be eating. Maybe when we cook our food using multiple ingredients (herbs and spices) or go to fancy restaurants that make complex depths, flavors, and textures we are really trying to hide and deceive ourselves into believing that the raw food/protein isn’t the real original form, that it is really altered from how that animal/food should be raised. I used to watch Food Network and I always liked and appreciated it when a chef says that a good meat (this applies to vegetable and fruit) should only need a little salt and pepper. For this reason, I keep my kids vegetable side for every meal very bland and unsophisticated. I don’t believe I am “stunting” my children’s palates. They don’t need this experience this early. Do we, should we even have this experience as adults? Hmmm. Let’s think about this. I am pleased to announce the arrival of my first book, Osteopathy for Children, available on Amazon or wherever books are sold. With this book I hope to explain all the subtle clues often overlooked by conventional pediatrics and specialists for that matter. These clues are picked up by the astute, concerned mommies and brushed aside by doctors of the CMS. Almost 200 pages, it should be digestable for non-medical people. For the curious, the avid reader, for the tree-hugging, natural health types below is a great teaser. This little girl is my patient. 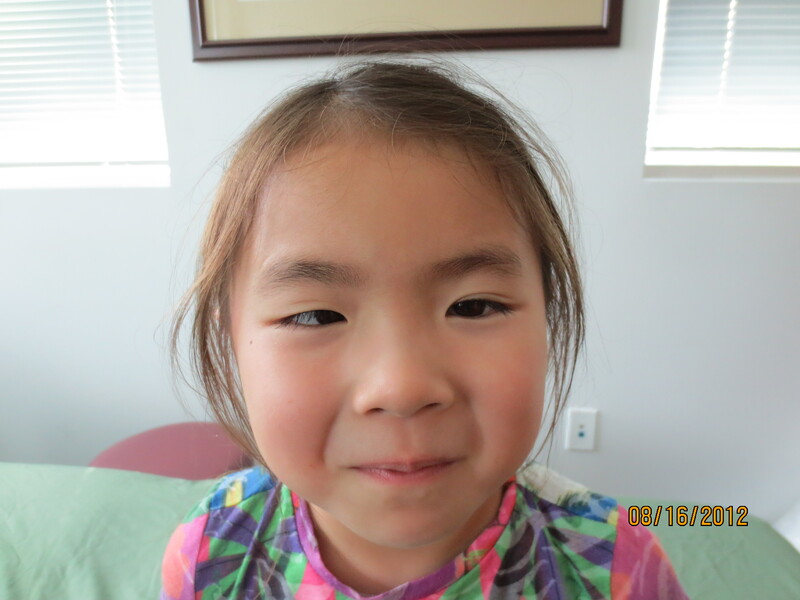 Forty minutes after treatment, her whole face has changed. Besides the obvious, there are 8 other features that are not normal for her. Can you guess? What happened to her? Was she born like this? How was this change accomplished? How many treatments did she need? 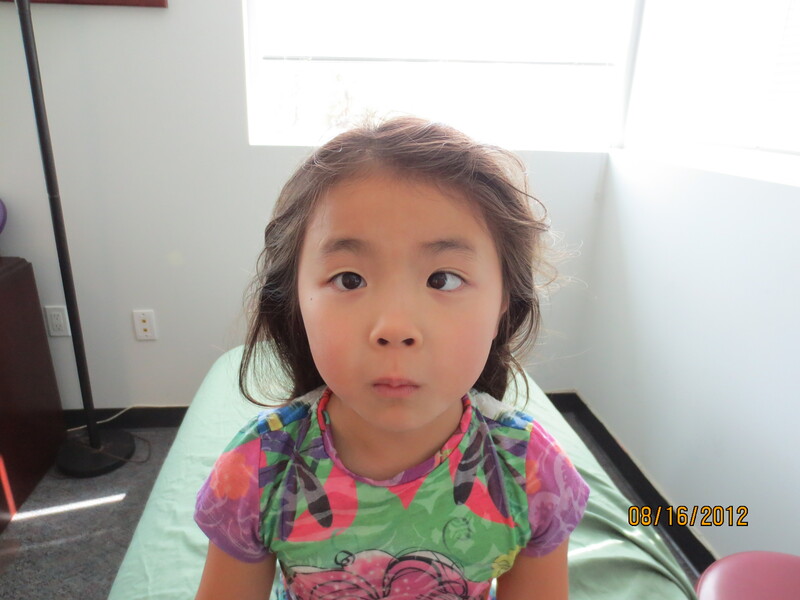 (only 12 with me, vision therapy did the rest, 60 sessions). What is the end result? No surgery. Better depth perception, better coordination, ability to read and comprehend, school work not such a struggle. I love what I do because she is now…free…to live her life the way it was intended…not needing me, not needing surgery (which would never have corrected the facial imbalances)…isn’t that just beautiful? Doctor, Why Can’t I Lose Weight? Hello All. Yes, for all of my three readers out there, it has been a while since I last posted. The reason has been that I have been deep, deep, deep in the trenches, working on so many long suffering sufferers who seek me out for my special Kung-Fu style of Traditional Osteopathy. I am now surfacing to report to the world and to you specific sufferers my new discoveries of classes of people suffering. Stay tuned in the upcoming months as I will more frequently post specific problems hitherto brushed off and blown off by the conventional medicine doctors who blame the patients for their medical problems. Today, I will introduce this brand new revolutionary concept of why, mostly young women (in their 20’s and early 30’s and especially, absolutely older women) are unable to lose weight, the conventional way, the way most normal people should lose weight, with slight modifications of their diet and lifestyle. For older women and mommies whose bodies don’t bounce back, a secondary question might be, “Doctor, why am I getting this cellulite? I would first like to address you younger women. Diets do not work. You eat well and healthy. You do not eat junk food, but the numbers on the scale never come down. You exercise but you don’t like it. You do not get the exercise “high” of endorphins surging through your body that most other people do. Some of you may even have what we medical people call “co-morbid conditions.” Doctors of the CMS (conventional medical system) think these “co-morbid conditions” are incidental and should just be treated symptomatically with a pill or nutrition counseling. I have seen enough of you young women with bowel problems, mostly IBS, which causes the tendency towards diarrhea and cramping and a few of you with constipation. I would like you to defy the doctors of the CMS and consider the possibility that your inability to enjoy exercise, your inability to lose “weight” and respond normally to exercise and your bowel symptoms are all related to a singular cause Isn’t this a more elegant possibility? I would like to keep you in suspense a little longer, and lead you to thinking like a detective with your body and your medical problems, so…let us ask a few more different questions. What is this “weight” problem? Is it fat? Is it really cellulite? Is this “weight” problem a “genetic inhertance” that you can never outrun? never fight? that the answer is surgical? The reason why nothing works is because…you are not…normal. I do not mean this to be cruel. I mean that your physiology has never been “right.” At some point in your early life, you can recall being happy, carefree with no body concerns and…normal,. Then one day you started to turn different, unaware, until it was too late..this slow insidious “weight” gain. This “weight” is really…water…simply…H2O…how did this happen…? Our bodies are 70% water, right? Are we one big giant sac? The answer is no. All this water is compartmentalized in different tissue spaces. When we experience a high velocity injury, our tissues are shocked. The water in those tissue compartments experience that force in that direction. For the rest of your life those tissue live in the memory of that trauma, they continue to live under the control of Newton’s First Law of Motion, regarding inertia. Any object in motion will tend to stay in motion, unless it is acted upon by an outside force, and that any object, not in motion can be impelled into motion by an outside force. The water molecules and all your tissues and every neuron in your brain were perfectly fine one day, then all of a sudden a car accident happened, the force of which propelled those compartmentalized molecules in a direction. You get out and everyone, including you, think that you are OK. My working theory is…you are not OK, and that you will never be OK unless someone else (a Traditional Osteopathic physician, like me) helps you. We cannot defy Newton’s First Law but we can certainly use Newton’s Third Law of Motion, the law of equal and opposites to prove to you the truth of the problems of your body. In summary, the car accident happened to your body (and caused all these physiologic derangements) and someone has to get it out. Now, the question for me is how do I safely guide you to its proof, without endangering you? This will be a lengthy exposition with some precautions, so I will need to do it on another post…stay tuned.